I've mostly been following the Tour De France this year via the internet, and so during this week I've been reviewing a variety of news sites for the depth, quality and usability of their online converage. 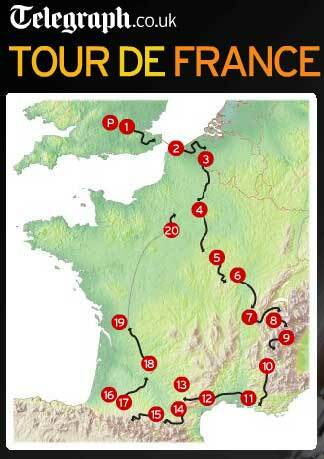 So far I've looked at the offical LeTour.fr site, the new Eurosport / Yahoo! sport portal, The Guardian, France 24 and BBC Sport. The Telegraph has been promoting their coverage online using Google AdWords to sidetrack people searching for "Tour De France"
The race has gained a place in The Telegraph's contextual sport left-hand navigation, and the cycling homepage has a big 2007 banner. The centre-piece of The Telegraph's coverage has been Brendan Gallagher's blog. The Telegraph has been making significant investment in their online blogging content and platform, and this is an example of it paying off. Unlike the BBC's Camper Van Ullrich series, I've been reading a lot of Brendan's writing. Pieces like Big Brother Breakfast haven't added much to my understanding of the science of cycling, but have provided an authentic glimpse behind the scenes at the journos over in France for the UK press. Although I can't agree with him that 'Guardian man' listening to The Smiths in this day and age represents a mid-life crisis. 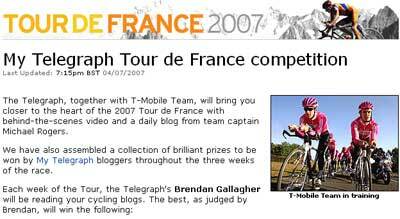 The Telegraph also had the T-Mobile team's Michael Rogers blogging on the site - but unfortunately he crashed out of the Tour, and hasn't posted since the 16th July - a real shame as it would have been interesting to get his perspective on the doping scandals that have erupted this week. The Telegraph has also been running competitions designed to encourage users of their My Telegraph service to blog about the Tour De France. Any blog post on My Telegraph posted in the Cycling category has automatically been entered into a weekly multi-sponsored competition with cycling related prizes. Gallagher has also been giving away 'spot' prizes by asking his readers quiz questions at the end of selected blog posts. The Telegraph has therefore been very good for some views and analysis around the tour, but it is a little let down by the lack of any sort of live coverage of the stages themselves. Another disappointment is their Flash interactive guide. The opening splash page is good at revealing that this year the route isn't so much a Tour De France as a Two/Thirds De France, but other than that it is very light on content. Unless I've missed something clickable somewhere, the guides to each individual stage seem restricted to a smattering of stats and a 2D map. This makes a particularly poor contrast with the effort put into The Guardian's interactive guide. All in all, although I have enjoyed Brendan's blog, I'm not convinced that The Telegraph's coverage has merited the online search engine marketing push behind it. Tomorrow I shall be looking at what in Tour De France terminology might be classified as 'abandons' - news sources that I thought would be a good place to find Tour coverage, but who appear to have dropped out of the race. By Martin Belam on 27 July 2007.